The Cubit also called Covid, unit of linear measure used by many ancient peoples. It may have originated in Egypt about 3000 BC; it thereafter became ubiquitous in the ancient world. The cubit, usually equal to about 18 inches (457 mm), was based on the length of the arm from the elbow to the tip of the middle finger. In some cultures it was as long as 21 inches (531 mm). Although there is evidence that many early civilizations devised standards of measurement and some tools for measuring, the Egyptian cubit is generally recognized as having been the most ubiquitous standard of linear measurement in the very ancient world. Developed about 3000 BC, it was based on the length of the arm from the elbow to the extended fingertips and was standardized by a royal master cubit of black granite, against which all the cubit sticks in use in Egypt were measured at regular intervals. The royal cubit (524 millimetres, or 20.62 inches) was subdivided in an extraordinarily complicated way. The basic subunit was the digit, doubtlessly a finger's breadth, of which there were 28 in the royal cubit. * Four digits equaled a palm, five a hand. * Twelve digits, or three palms, equaled a small span. * Fourteen digits, or one-half a cubit, equaled a large span. * Sixteen digits, or four palms, made one t'ser. * Twenty-four digits, or six palms, were a small cubit. Fig 1. Royal Cubit Stick (showing the Lunar associations). The digit was in turn subdivided. Reading from right to left in the upper register, the 14th digit on a cubit stick was marked off into 16 equal parts. The next digit was divided into 15 parts, and so on, to the 28th digit, which was divided into 2 equal parts. Thus, measurement could be made to digit fractions with any denominator from 2 through 16. The smallest division, 1/16 of a digit, was equal to 1/448 part of a royal cubit. The accuracy of the cubit stick is attested by the dimensions of the Great Pyramid of Giza; although thousands were employed in building it, its sides vary no more than 0.05 percent from the mean length of 230.364 m (9,069.45 ins). The Egyptians developed methods and instruments for measuring land at a very early date. The annual flood of the Nile River created a need for benchmarks and surveying techniques so that property boundaries could be readily reestablished when the water receded. The Egyptian weight system appears to have been founded on a unit called the kite, with a decimal ratio, 10 kites equaling 1 deben, and 10 debens equaling 1 sep. Over the long span of Egyptian history, the weight of the kite varied from period to period, ranging all the way from 4.5 to 29.9 grams (0.16 to 1.05 ounce). About 3,400 different weights have been recovered from ancient Egypt, some in basic geometric shapes, others in human and animal forms. Egyptian liquid measures, from large to small, were ro, hin, hekat, khar, and cubic cubit (0.14 metre3 [37 gallons US]). Let each compartment be 30 cubits by 7 cubits." This problem, and three others like it in the same letter, cannot be solved without further data. But the point of the humour is clear, as Hori challenges his rival with these hard, but typical, tasks. What is known of Egyptian mathematics tallies well with the tests posed by the scribe Hori. The information comes primarily from two long papyrus documents that once served as textbooks within scribal schools. The Rhind Papyrus (in the British Museum) is a copy made in the 17th century BC of a text two centuries older still. In it is found a long table of fractional parts to help with division, followed by the solutions of 84 specific problems in arithmetic and geometry. The Golenishchev Papyrus (in the Moscow Museum of Fine Arts), dating from the 19th century BC, presents 25 problems of a similar type. These problems reflect well the functions the scribes would perform, for they deal with how to distribute beer and bread as wages, for example, or how to measure the areas of fields or the volumes of pyramids and other solids. Akhenaton's kingdom covered a territory the size of "six iteru, three-quarters of a khet and four cubits the side," - from the north stela to the south stela - or about thirteen thousand meters." It has long been accepted that the measurement systems used throughout the Greek and Roman world had first been perfected in Egypt. What is universally referred to as the 'common Egyptian' foot of 300mm continued to be used in Rome in conjunction with the system that is acknowledged as 'Roman'. This Roman system is related to the Greek by a ratio of 24 to 25, and it is the measurements adopted by the Greeks that are the true basis of the Egyptian structure. What is accepted as "common" Egyptian measure is related to the "royal" by a ratio of 6 to 7. Thus, six palms of four digits is the common Egyptian cubit, and seven palms, or 28 digits, is the royal Egyptian cubit. This six to seven ratio links values in a multitude of systems. It is, for example, the ratio of the human anatomical foot being one seventh of the overall height of the canonical man, which height is then regarded as six feet of the longer value. (If the anatomical foot is a half royal Egyptian cubit, then the man is six English feet tall). Many examples of statuary throughout the ancient world overtly display this identical ratio in other values and systems. However, the convention of dividing the royal cubit solely into 28 digits was a comparatively late development of the New Kingdom, which was after 1350 BC. Middle Kingdom rods carried a dual scale of 24 digits and 28 digits. But Old Kingdom cubit rods, from 3400 BC, although of the identical lengths, were divided exclusively into 24 digits. It was a widely held conception, repeated by Herodotus, that the royal cubit was three digits longer than the common. Therefore, the true common cubit of the Egyptians was related to the royal by a ratio of seven to eight, and this is the exact relationship of the Greek system to the royal Egyptian. This seven to eight relationship between measures is as widespread as is the now accepted six to seven. Very distinct relationships, by variations of a single fraction, are immediately apparent in these comparisons. The acceptance of this fact is fundamental to an understanding of ancient metrology. For this is how the Egyptians calculated. A multiple fraction, say 4/7ths would not be recognised, because only one seventh could occupy the seventh place. This fraction would therefore have to be expressed as ? + 1/14th. That is, the greater fraction would have to be written first, and depending on the complexity of the original fraction in question, lesser fractions would diminutively approach its solution. For day-to-day problems involving such questions as amounts to be shared among numbers etc., this is an extremely clumsy system. As many as forty of these diminishing single fractions have been recorded in expressing one multiple fraction, (such as 261/383, etc.). When the method is applied to metrology, it works extremely well. Therefore, these exoteric methods of calculation, which were also practised by the Greeks and Romans, may well stem from a base of metrology; when applied to day-to-day problems, although simple, are extremely laborious. It is hardly likely that the scientists used such cumbrous methods. It is a virtual certainty that the decimal method of calculation was known, although not divulged to the general workforce and artisans. Another of the fundamental truths, which must be acknowledged to come to an understanding of the complexities of ancient metrology, is the fact that the primary system adopted by the Greeks is the root from which all other systems develop. For it is the variations of the Greek foot, that when expressed in terms of the English foot are also equations. The values are the formulae by which all of the other measures that develop from it are divided or multiplied into their classifications. All other systems of mensuration stem from the Root English (Greek) foot, by the addition or subtraction of a substantial fraction. It is not the royal cubit, nor any other of these ancient standards, that is the basis of their systems, for they themselves are compounds. The basic, or Rootroyal Egyptian cubit, is 12/7 English feet, or 1.7142857ft; this is the English cubit of 1.57 ft plus one seventh. Many examples of the use of this value are recognized with close precision. One of the three ritualistic standard cubit rods of the Egyptian Museum of Turin (Fig. 1) is given as 20.587 ins, and 12/7 English feet are 20.5714 ins. John Perring, when he surveyed the pyramid of Amenemhet III at Dashur, found the base side to measure 342.5 ft, and 200 royal cubits of 12/7ft are 342.8571ft. The cubit of construction in the step pyramid of Zoser is given as 20.55 inches. Therefore is possible to state in absolute terms, this length, among others, as a standard expression of the royal cubit. It is by the addition of the 440th part to this Root cubit that it becomes the Standard royal cubit of 1.71818ft. This is the precise length of the cubit of the Giza complex, as established by Petrie's survey of 1882. Both of these, Root and Standard royal Egyptian cubits, develop into the other recognised variants by the addition or subtraction of their 175th part. Mathematical reasons and examples for these fractional shifts are given in the Greek, Roman and Megalithic hyperlinks. The tables that have been compiled, express the rigidly mathematical structure which underpins ancient metrology. However, in all nations, there are minor variations that do not adhere to these given values. Invariably these prove to be localised geographic variations, for the length of the meridian degree varies at all latitudes and the whole system is essentially geodetic. 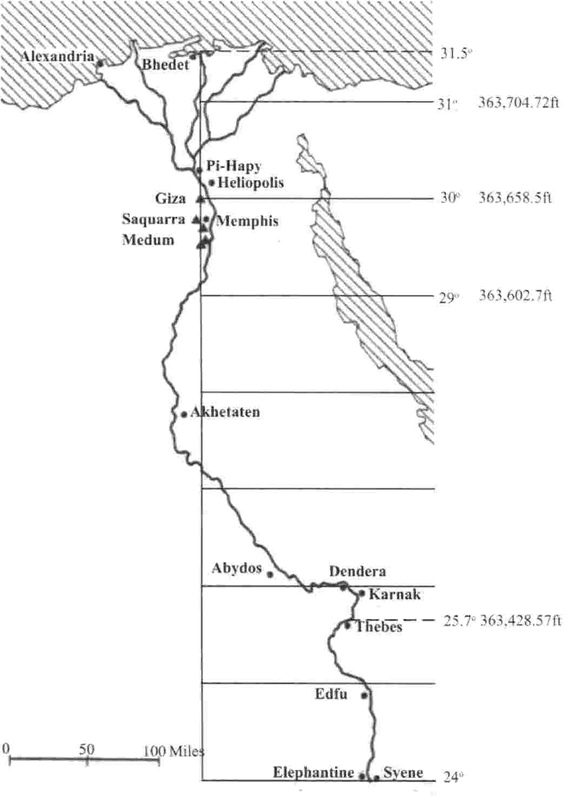 The author is not the first to remark that the Egyptians measured itinerary distances by geographic degrees -- the analysis of the pyramid dimensions leaves little room for doubt on that score. The temple of Amun at Thebes was considered to be at the geodetic centre of Egypt, and the ornate omphalos discovered by Reisner at that location, is the trig point from which all distances were calculated. It is significant that Thebes is two sevenths of the distance from the equator to the pole, the degree at that latitude is the septenary 363428.57ft. The geographic foot, or the 360,000th part, of this degree is 1.009524ft, this is 106 to 105 English feet. The Root royal cubit fits this degree exactly 212,000 times and by the convention established by Eratosthenes that there are 210,000 royal cubits to the degree, then this geographic variant of the royal cubit is 1.7306ft, which is 12/7 x 106/105, (or 1.71428ft x 1.009524ft). This explains why certain measures, such as this geographic cubit, do not conform to the tables of the strictly mathematical variations. It would seem that a cubit of this length, 1.7306ft, was used in the pyramid of Mycerinus, at 200 in the base side, and is within one part in 5400 of the cubit of Denderah, found by Clark and Engelbach, reported as 527.588 mm, and 1.7306ft is 527.486mm. Also recovered from the temple of Amun, were three ritual stone cubit rods, they each carried the identical inscription, which stated that the overall length of Egypt, from Bhedet in the north to Syene in the south was 106 "atur". (An "atur" was 15,000 royal cubits, a "schoenus" was 12,000 royal cubits, and a "minute of march" was 150 royal cubits, as itinerary distances). The southern boundary of Egypt was taken to be different points for a variety of calculations, often enough, these would be natural features such as the great cataract, at the furthest point south. Then the first cataract as another acceptance of the boundary; also celestial bearings such as the tropic at around 24º. Before 1000 BC, Syene was reckoned as one of the southern limits, at 24º 06', where, at that time, the upper horn of the sun shone perpendicularly down a well only at the summer solstice. A contrived, or rather, calculated, southern limit was considered to be a little to the north near Aswan, at a point on Biga island and it is around this location, that the only royal cubit that would be a solution to the distance of 106 atur being the overall length of Egypt, would be the root cubit of 12/7 English feet. There is little doubt that Egyptians regarded such distances in geographic terms, or that they measured with this degree of accuracy. "6 atur, 3/4 of a khet and 4 cubits in extent". Thus, over a distance exceeding 30 miles, the surveyors took into account single cubits. Fig 3. The location of Akhetaten, at the geographical centre of Egypt. Measures of all descriptions, adopted by a great number of nations, are acknowledged to have been used in Egypt, but these are the basics of their metrology, together with some of its applications. Although the Egyptians are acknowledged to have perfected the system and preserved it through an astonishing period of time -- the evidence would certainly imply that they neither invented nor discovered it. This is because contemporary cultures, with whom the Egyptians had no contact and were separated from by enormous distances, may be demonstrated to have used the identical system.